FILE - G-7 leaders, from left, European Council President Donald Tusk, Canadian Prime Minister Justin Trudeau, German Chancellor Angela Merkel, U.S. President Donald Trump and Italian Prime Minister Paolo Gentiloni confer at the Ancient Greek Theater of Taormina, May 26, 2017, in Taormina, Italy. The European Commission president on Wednesday said that it was the "duty of Europe" to stand up to the U.S. if President Donald Trump decided to pull his country out of the Paris climate change accord. Juncker went on to say that the Group of Seven leaders "tried to explain this in clear, simple sentences to Mr. Trump" at a recent summit in Italy. He said that even though "it looks like that attempt failed" ... the "law is the law." In a gibe at the U.S. administration, Juncker told the audience at an event of the Confederation of German Employers in Berlin that "not everything that is written in international agreements is fake news." Juncker said: "If the U.S. president pulls out of the Paris agreement, and he will in the next days or hours, then it is Europe's duty to say that that is not how it works." A White House official said earlier in the day that Trump was planning to pull out of the Paris deal, although a final decision hadn't been made. Trump on Wednesday declared that abandoning the Paris climate agreement would be a victory for the American economy. The European Union and China, meanwhile, will reaffirm their commitment to the climate accord this week regardless of whether the U.S. pulls out of the pact, a senior EU official said. The official told reporters that the EU and China will also "spell out" how they plan to meet their commitments to the landmark international accord to fight global warming at talks in Brussels on Friday. The official is involved in preparing the meeting between EU Council President Donald Tusk, Juncker and Chinese Premier Li Keqiang, but can't speak on the record because their meeting statement wasn't finalized. Li and a major Chinese delegation are due to arrive in Brussels late Thursday following talks in Berlin. 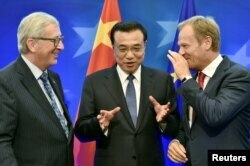 FILE - European Commission President Jean-Claude Juncker, left,Chinese Premier Li Keqiang, center, and European Council President Donald Tusk attend a signing ceremony during a EU-China summit in Brussels, June 29, 2015. The three will meet Friday to discuss their commitments to the Paris Agreement on fighting global warming. "The EU and China are joining forces to forge ahead on the implementation of the Paris Agreement and accelerate the global transition to clean energy," EU climate commissioner Miguel Arias Canete said about the upcoming EU-China summit, stressing they remain committed to Paris. A White House official said Wednesday that there could be "caveats in the language" announcing a withdrawal, leaving open the possibility that Trump's decision isn't final. That possibility was met with derisive howls from EU lawmakers when a session of the European Parliament was informed about it. "Climate change is not a fairy tale. It is a tough reality which affects people's daily lives," European Parliament President Antonio Tajani said in a statement. "People die or are obliged to leave their homes because of desertification, lack of water, exposure to disease, extreme weather conditions. If we don't act swiftly and boldly, the huge human and economic cost will continue to increase." Tajani suggested that Washington's withdrawal should be a signal for Europe to step up its efforts — and reap the benefits. "Our climate action strategy represents an opportunity to attract investment, innovation and develop new green technologies," he said. "We have got the talent and the will to make this possible in all sectors." Tajani said earlier he would confer with Tusk and Juncker about "joint initiatives to be adopted together as a European Union" to offset the decision. The EU official involved in organizing the EU-China meeting said it would "send important signals for the multinational system," as Trump moves to alter or abandon some of the international trade agreements the U.S. has signed. Alden Meyer, director of strategy and policy for the Union of Concerned Scientists advocacy group, said, "I don't think any other countries will follow the U.S. out of Paris, so if he does leave, Trump will be in splendid isolation with the leaders of Syria and Nicaragua." In Madrid, the leaders of India and Spain expressed their commitment to fighting climate change and reiterated their support for implanting the Kyoto and Paris accords. In a joint statement issued following talks in the Spanish capital between Indian Prime Minister Narendra Modi and Spanish counterpart Mariano Rajoy, the two countries said taking action on climate change was a priority for both nations. On Tuesday, Modi said in Berlin that it would be a "crime" to spoil the environment for future generations as the world awaits a decision on U.S. climate policy. Rajoy and Modi agreed to boost bilateral cooperation in combating climate change.